Article taken from the Telegraph newspaper. Picking through dense jungle, rarely snapping a twig or bending a blade of grass, the British Army’s ‘super tracker’ silently moves inches closer to a poacher’s camp, knowing a single sound could draw the attention of ruthless killers armed with AK47s and grenade launchers. 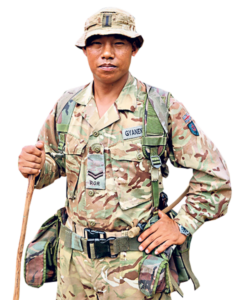 Corporal Gyanendra Rai, 31, of 1st Battalion The Royal Gurkha Rifles was sent by the British Army to answer an SOS from the Gabon government. The central African country is desperate to stop poachers slaughtering its rare forest elephants, 36,000 of which have been killed in the past 10 years. When following humans you are looking for regularity of signs foot prints, the round mark of the end of a cane, or cargo or a weapon being dragged. You are also looking on the ground for cigarette butts, wrappers, human materials. Corporal Gyanendra Rai, who fought alongside Prince Harry on his debut tour of Afghanistan in 2007, learned his craft as a tracker in Brunei, where the SAS are sent to learn jungle skills and evade capture. He now faces ruthless poacher gangs who will stop at nothing to get their prize including slaughtering baby elephants with tusks an inch long and using children as young as eight as mules to carry their weapons and contraband. Christian Mbina, Gabon Park’s technical director, says being shot at by poachers is common for his men. The poachers are not necessarily very specialised but they have very heavy duty weapons; Kalashnikovs, machetes, grenade launchers. Fortunately we have not had an eco guard killed. But just last year we had a soldier who was shot on patrol and is still disabled from this injury. They know every day when they go out it could cost their lives. Corporal Rai fought in three Afghan tours, where another member of his regiment, Corporal Dip Prasad Pun, received a Conspicuous Gallantry Cross in 2010 for fighting off 30 Taliban fighters, battering the last one with a machine gun tripod when his ammunition ran out. Levison Wood, TV explorer, Army Reserve officer and ambassador for The Tusk Trust, says the work Rai is doing to save Africa’s elephants is essential. 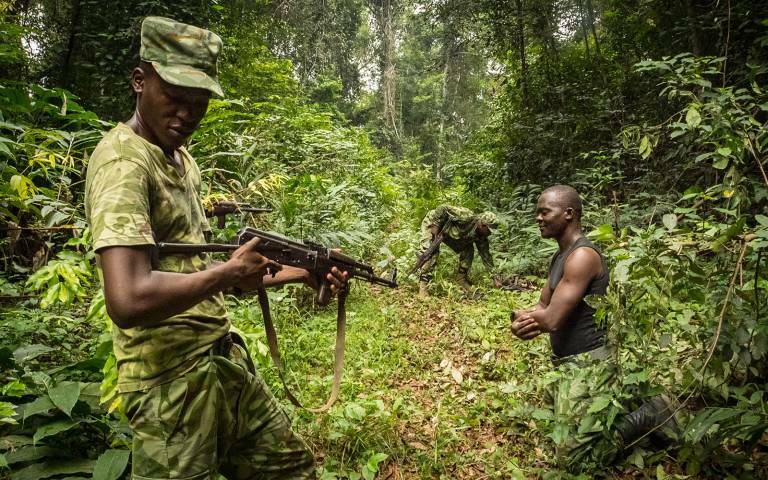 This is extremely important work the British Army is doing to help the Gabonese preserve their elephants in the toughest environment possible. There are so few left it’s critical we do all we can to support conservation. I worked alongside the Gurkhas in the Army and they are the best in the world at jungle survival. The humidity and climate in the jungle makes work treacherous and cuts take longer to heal, rescue is extremely difficult, and getting lost is a daily hazard.With elephants and gorillas around, poachers are not always the greatest danger. If we encounter gorillas they will definitely attack you if you try to run away, Rai said. The jungle is a second home to Rai, and far removed from the Catterick Garrison where he once trained. Gliding over fallen trees and vines, Rai can study a scuffed mark or blade of grass and pick out exactly which way a poacher went and how long ago. You are looking for the freshness of a trail. Little plants start to grow out of any footprint within two days and rain is common so you can tell how fresh a print is by how dry or clean it is.